Providing hay for your companion rabbit is vital for the overall health of the animal. Rabbits are herbivores and rely on consumption of large quantities of low-quality fibrous plant material to meet their nutrient needs. The gastrointestinal tract of the rabbit and many other small herbivores is specially designed to ferment large quantities of fiber in the cecum or large intestine. 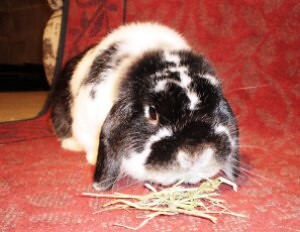 Dried plant material or hay is the best way to offer this fiber to a companion rabbit. Providing unlimited access to grass hay in the diet aids in the prevention of dental disease, obesity, gastrointestinal stasis, and boredom. It also prevents diarrhea and maintains overall gastrointestinal health. Hay should be provided ad libitum, or free access. The quality of hay is dependent on several factors. With hay being a product of nature, it is highly subject to variability. The environment in which hay is grown will affect its overall nutritional value. Additional factors affecting hay quality include soil conditions, rainfall concentrations during growing season, stage of maturity when hay was cut, and the number of times per growing season the field was harvested. In addition, after the hay is cut, its curing, handling, and storage can also affect its quality. The type of plant from which the hay was cut has the greatest nutritional impact on the hay's content. Two types or classes of hay are often fed to rabbits: legume and grass hays. One of the best well-known examples of a commonly fed legume hay is alfalfa. Alfalfa hay is a long-stranded, high-fiber legume hay which contains increased amounts of protein, energy, and calcium compared to grass hays. Grass hays fed to rabbits can come from a variety of different grasses but are most commonly from timothy grass. Additional grass hays available to rabbits include brome, orchard, and oat hays. Nutritionally, grass hays are long-stranded high-fiber hays but contain lower amounts of protein, energy, and calcium, distinguishing them from legume hays. These key nutritional differences are important to understand as they play essential roles in the different life stages of a rabbit. As a general rule, alfalfa hay should only be fed to young and growing animals (under one year of age) and gestating or lactating females. During these life stages, the animals have higher nutrient requirements which can be supplied from the higher protein, calcium, and energy contents of the alfalfa hay. Adult animals should be fed grass hays as this will assist in preventing obesity and other health concerns in these animals. When choosing the specific hay to feed your companion rabbit, you should examine the hay thoroughly. The hay should include a mixture of stems and leaves. The stems contain the majority of the fiber, while the leaves contain most of the other nutrients. High quantities of stems can reduce the nutrient quality, but hay containing increased amounts of leaves may be too rich, causing digestive upset. Ensure the hay is free of dust. The hay should give off a sweet aroma and be a greenish to green-gray color. Hay that is brown or yellow is overmature and will have lost the majority of its nutritional value. The plant at this stage is storing all of its energy in the seed, lowering its nutritional quality. Companies with high-quality grass hays require early harvesting to maintain nutritional quality of the stems and leaves. Hay with mildew or a musty smell could contain mold, which could cause digestive upset or other illness. This is why proper storage away from moisture is key. It is important to note that hay changes in appearance from batch to batch, so slight changes in appearance over time should be expected. Once purchased, the hay must be properly stored to maintain its high quality. Hay should be stored off the floor in a cool, dry location with low humidity away from any moisture contact. Storing damp or wet hay creates the perfect environment for mold growth. Depending on the type of hay, with proper storage conditions, hay can potentially maintain its quality for a minimum of three years. Even though hay is a vital component of maintaining a healthy diet, it is important to monitor your rabbit’s habits when consuming hay. It is recommended that your rabbit consume a pile of hay equivalent to its body size daily, although unlimited access to hay should be available at all times. If you notice changes in the animal's eating behaviors, it may be beneficial to evaluate the hay for changes in quality of composition. Also, offering a variety of grass hays is a great way to provide a diverse mixture of flavors to the diet to keep the rabbit interested. In addition, it is important to visit your local veterinarian regularly for checkups which could rule out any health problems related to changes in eating habits.